I will be posting my current Sarasota fishing report on this page. It will be updated every week or two as conditions and species change. It will include the baits or lures along with the species and locations. Clients on Sarasota fishing charters had decent action tis week, although weather was an issue early and late in the week. Wind not only makes it difficult to fish, it stirs up the water. Finding “clean” water was important. Every spot that was dirty only produced catfish. Flats that were better produced a lot of ladyfish with a few jack crevalle and bluefish mixed in. Most of the fish hit Bass Assassin jigs, but shrimp caught some fish as well. We had an excellent fly fishing trip on Thursday morning. The grass flats north on New Pass were very clear with a lot of bait. Fish were busting on the surface and chartreuse/white Clouser MInnow patters were very productive. Anglers on Sarasota fishing charters this week experienced decent action on the grass flats near Big Pass. Ladyfish were fairly plentiful with a few other species mixed in. Speckled trout to 18″, Spanish mackerel and bluefish to 2 pounds, jacks and sail cats hit Bass Assassin jigs, live shrimp, and threadfin herring. Brian caught the fish of the week as he wrestled a nice redfish out from under a Siesta Key dock using live shrimp. Ladyfish were also caught in Big Pass on jigs. I only targeted sheepshead one day, but the bite was still strong in the rocks in the pass. Fishing was decent this week, though clients on Sarasota fishing charters had to battle some wind and a little rain. The sheepshead bite continued to be very good. Live shrimp fished on the bottom near structure and docks in both Big Sarasota Pass and New Pass produced plenty of nice sized fish. Though the spawning run is winding down, there are plenty of fish that are still around. Anglers seeking action found it by casting Bass Assassin jigs on the grass flats on the east side of the bay. A couple of speckled trout were caught as well, which is a great sign. Fishing was steady once again this week, though anglers did have to battle some breezy conditions. 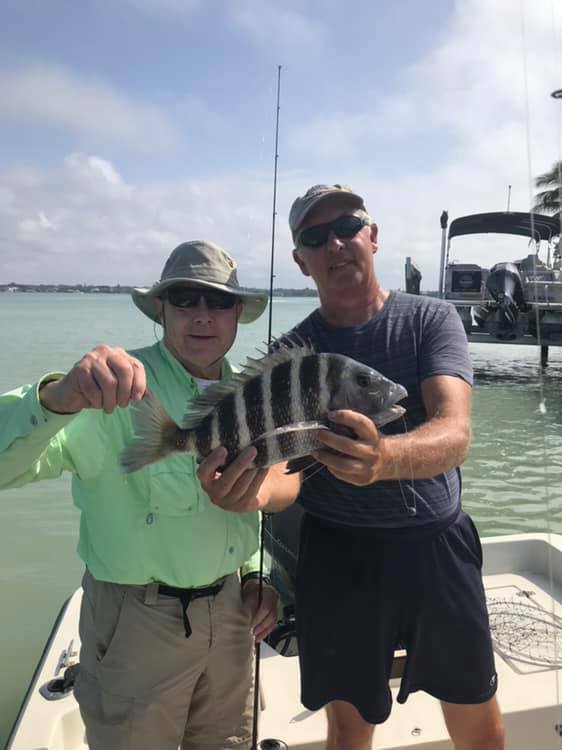 The sheepshead bite was very good, with most of the fishing being in the 2 pound range. Rocks, docks, and other structure, particularly in the passes, held plenty of fish. Live shrimp was the best bait. Ladyfish hit Bass Assassin jigs in Robert’s Bay on the incoming tide. Anglers casting flies hooked them as well as a snook up in a residential canal. 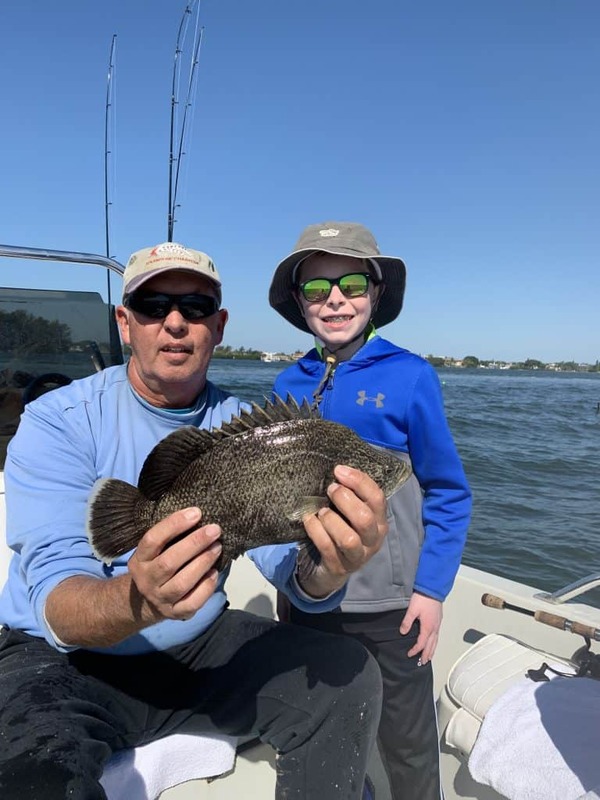 One young angler sight cast to a couple of tripletail in the bay and caught one on a live shrimp. 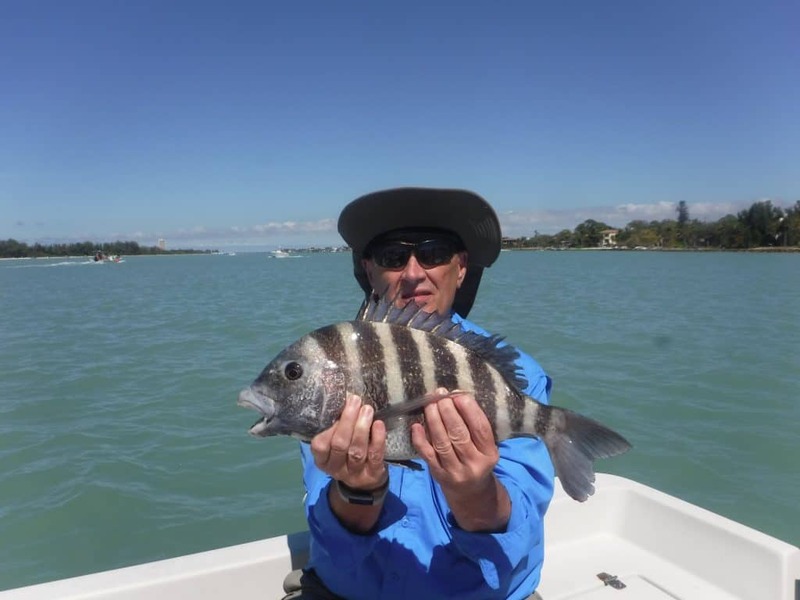 The sheepshead bite remains strong in both Big Sarasota Pass, New Pass, and surrounding docks and bridges. Live or frozen shrimp fished on the bottom worked well. Most of the fish were in the 2lb range, with some larger ones mixed in. Small Spanish mackerel hit Rapala plugs trolled and cast in the passes and inshore Gulf of Mexico. Ladyfish and the occasional Spanish mackerel and speckled trout hit jigs and shrimp on the deeper flats. We had perfect conditions on Tuesday and caught a half dozen king mackerel trolling spoons in the Gulf of Mexico just off off the inshore artificial reefs. 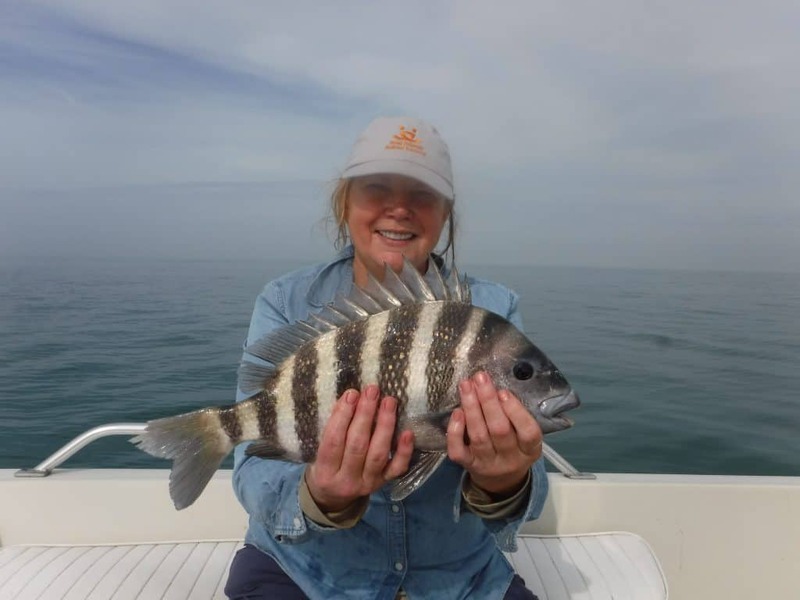 Sheepshead were caught around structure in Sarasota Bay and on the artificial reefs in the inshore Gulf of Mexico. This has been the most consistent bite for the last few weeks. Live shrimp caught them along with a few mangrove snapper. Docks and structure in both passes were the top spots. Also, there is a ton of tiny fry bait in Robert’s Bay which has attracted good numbers of ladyfish. Clients caught them using Bass Assassin jigs and live shrimp. Dolphins were aggressive and shut down the bite several times. A few speckled trout were landed as well. The big jack bite was hot for another week, but then slowed down after the cold front. Water temperatures in the mid 50’s sent the fish seeking warmer water. Before the front, jacks to 12 pounds, snook, and redfish hit Rapala plugs in the Manatee River. Hopefully the upcoming warm weather will get them biting again. The best action in Sarasota Bay was sheepshead hitting live shrimp around structure. The fish are spread out and it seems like their numbers are increasing each week. Small snook hit lures in creeks and residential canals. 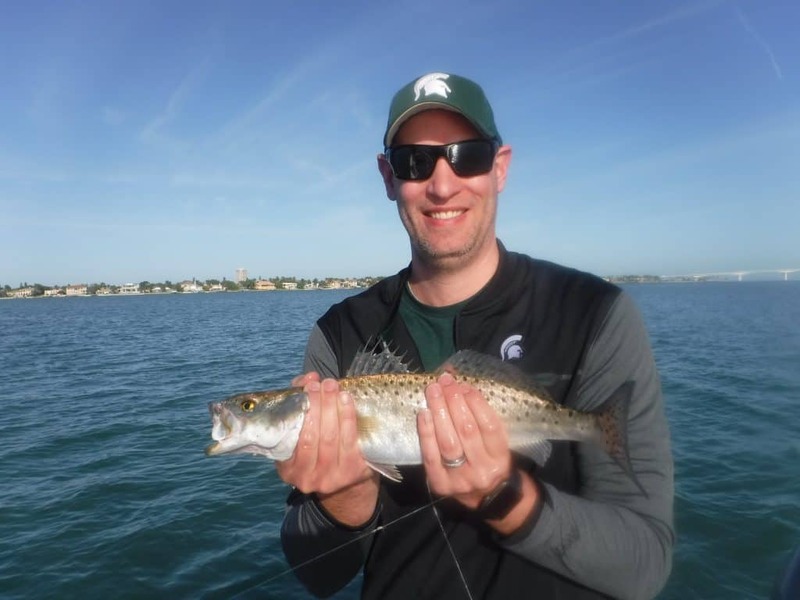 Winter fishing patterns continue in Sarasota. 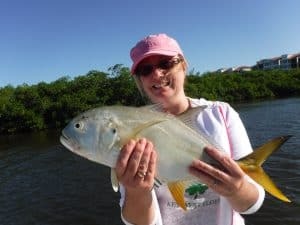 The best two patterns have been fishing docks with live shrimp for sheepshead and black drum and casting plugs and jigs in creeks and rivers for jack crevalle and snook. Docks in 8′ to 10′ of water near Big Pass produced sheepshead and drum. Most of them were solid fish in the 14″ to 16″ range. 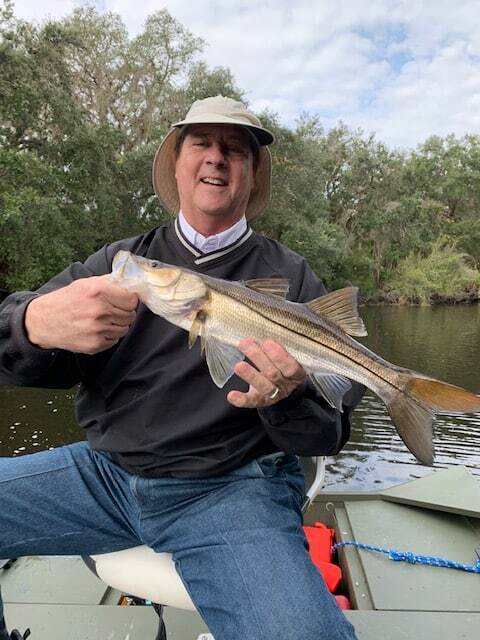 Anglers casting Rapala plugs in Phillippi Creek fooled snook and jacks. The Manatee River has some VERY big jacks that were breaking on the surface and hit jigs and plugs. Weather was an issue over the last two weeks. However, the forecast is good for the holiday week. Ladyfish hit jigs on drop-offs in 7′ to 10′ of water. Sheepshead were present in good numbers under docks near Big Pass. 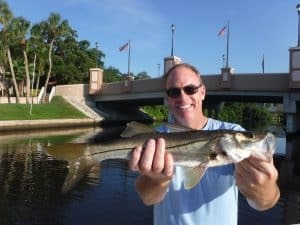 Snook and jacks have moved up into residential canals and creeks. Anglers fishing the Myakka River hooked snook and gar casting plugs. Weather has been an issue the last two weeks. Several severe fronts moved through and I had to cancel several trips due to wind around 20 knots. It does seem to have helped the rd tide, though. Ladyfish and small Spanish mackerel were breaking on the surface off of Siesta Key. Sheepshead and snapper took shrimp fished under docks and along rocky channel edges, especially south of Siesta Drive Bridge. Cooler water has snook and jacks moving up into area cheeks and rivers. Fishing remained steady, though unspectacular, over the last two weeks. Red tide still persists off the beaches and in Sarasota Bay, from the passes north. 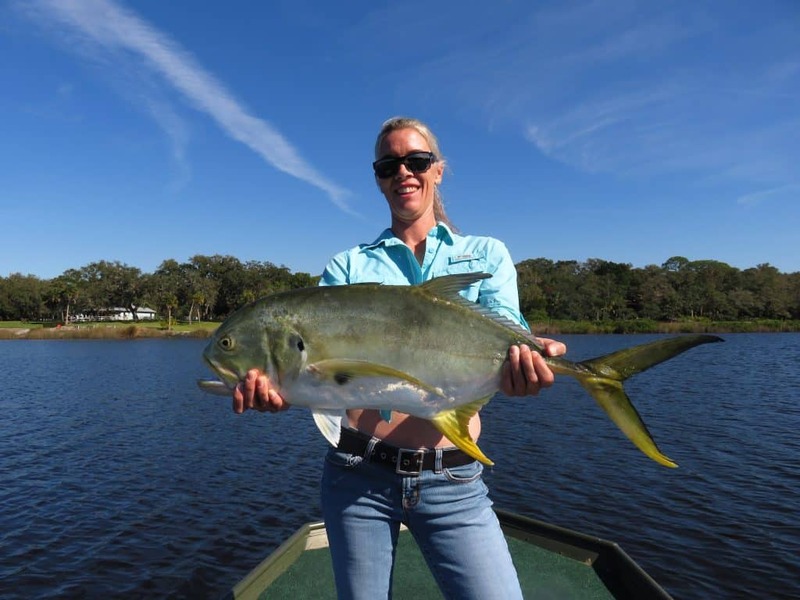 The best fishing has been in the area from Siesta Drive south to Blackburn Point. Sheepshead moved into the area and were caught under docks by clients using shrimp. Mangrove snapper were caught in the same spots as well. Jack crevelle hit plugs in residential canals and creeks. Ladyfish were caught on jigs on the open flats. I did most of my fishing in the area rivers. Anglers had good success on snook, jack crevelle, and largemouth bass casting Rapala plugs. 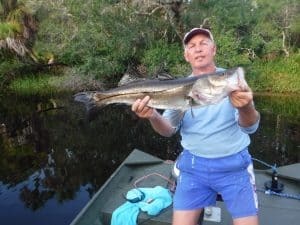 Snook ranged from 15″ to 15 pounds. We landed fish to 35″ and lost two larger ones. #10 gold Rapala X-Raps and BX Minnow plugs fooled all of the fish. The Braden River, Myakka River, and Manatee River were all productive. Charters in Sarasota Bay were a bit slower, with jack crevelle to 4 pounds and mangrove snapper hitting pilchards fished under docks and along shorelines. The area south of Siesta Drive down to Blackburn Point provided steady action for clients on Sarasota fishing charters this week. I got out a couple of times after Hurricane Michael moved through. The water was a bit stirred up, but the fish did not mind. We had outgoing tides in the morning this week. The best spots were creek and canal mouths along with docks on points. Rapala X-Raps produced a few fish at first light, but most of the fish were caught using live pilchards. Bait was present on the flats in several spots near Big Pass. 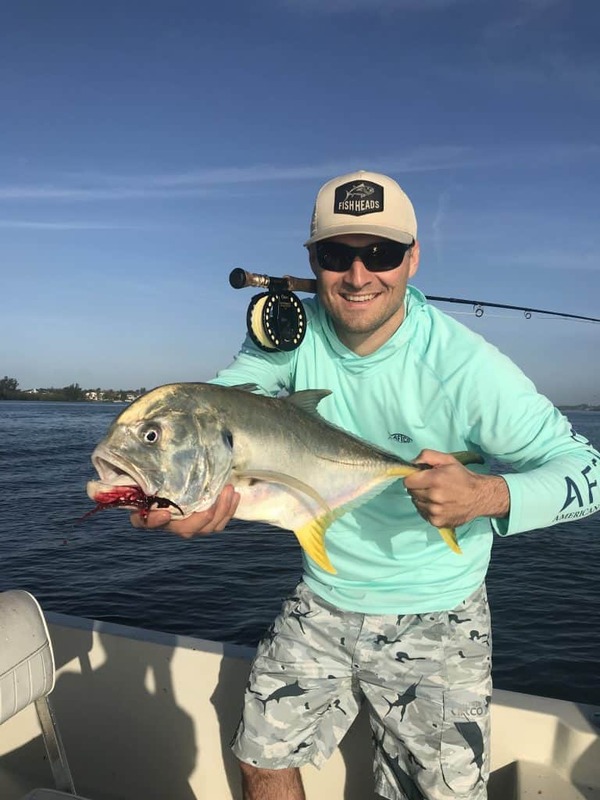 Chumming docks, shorelines, oyster bars, and creek mouths produced snook (mostly schoolies), jack crevelle to 4 pounds, and mangrove snapper to 15″. Action should improve as it cools off. Great to see the bay clearing and the fish biting! I am back from a long road trip up to New Hampshire and Maine. Red tide was pretty bad when I left around Labor Day. It is still present, though the effects have eased off a bit. 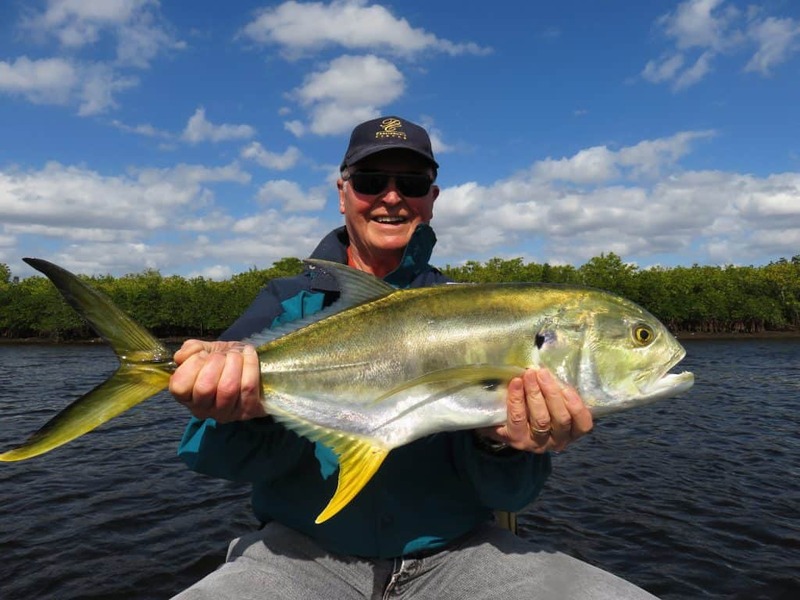 Persistent anglers can find juvenile snook, jacks, and mangrove snapper’s in the area at the south end of Siesta Key. A few schools of ladyfish are showing up in the flats around the passes and out on the beach. This is a good sign of things clearing up! I have been doing a little freshwater fishing and local lakes. Bluegill and other panfish along with a few crappie are caught using jigs and small spinner baits. This fishing, like our saltwater fishing, will pick up as it cools off and the water temperature drops. There are many factors that go into fishing success. My Sarasota fishing report page will reflect this. Seasonal patterns are one of the primary factors influencing fishing success. Anglers can view my complete Sarasota fishing forecast. Fishing in the cooler months is all about the weather. We start receiving serious cold fronts here in Sarasota, Florida around November. They usually persist until mid-March. Unseasonably pleasant winters will result in fish maintaining their spring and fall patterns. Conversely, an unusually cold winter will keep fish in their winter pattern. In the winter time I do three types of fishing; bottom fishing, River snook fishing, and on nice days drifting the deep grass flats. I use live shrimp to bottom fish for sheepshead, snapper, drum, and other species around docs and other structure. 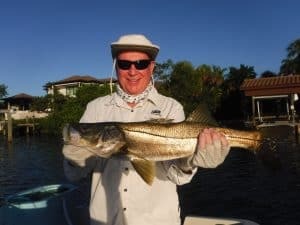 Local area rivers produce snook and bass for anglers casting plugs. When conditions are favorable on the open flats, we use jigs and live shrimp to catch a variety of species. As it warms up fish move out of the deeper waters where they spend the winter. The flats and passes become alive with snook, redfish, speckled trout, Spanish mackerel, bluefish, jacks, ladyfish, and other species. 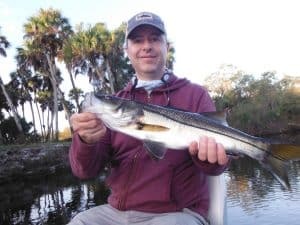 The passes and deep flats produce the most action while some anglers seek the challenge of catching snook in redfish in the back country. When conditions are right, the fishing in the inshore Gulf of Mexico can be fantastic! East winds will result in clear water and plenty of baitfish. This will in turn attract Spanish mackerel, false albacore, sharks, cobia, and other species. Often times, the fish will be seen feeding aggressively on the surface. This is great fun as just about anything tossed into the feeding frenzy will draw strike. For many anglers, the heat of summer means one thing; tarpon! The silver Kings invade our area in early May and stay until late July. This is very challenging fishing, and not for everyone. However the reward is the fish of a lifetime! Tarpon to 150 pounds are landed off of the area beaches every summer. While I still do a little tarpon fishing, most of my summer trips are run in Sarasota Bay. 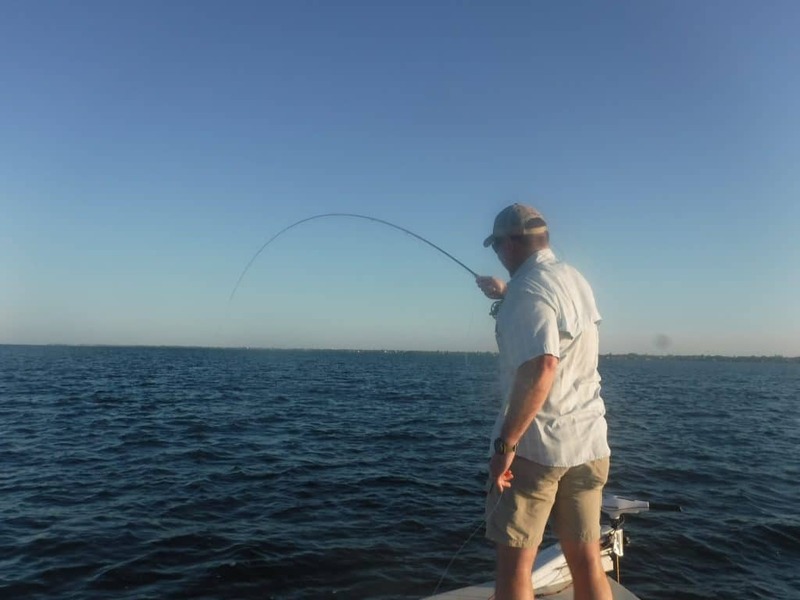 With all the anglers out on the beach chasing tarpon, fishing pressure in the Bay is lighter. My normal approach is to cast lures or shrimp at first light then use my cast net to catch bait and chum mid morning. Either way, with the heat of summer, we are will off the water early. You’ll see me mention “deep grass flats”often in my Sarasota fishing report. This is where the majority of fish on my fishing charters are landed. These areas are large with a mixture of grass and sand bottom. Shrimp, crabs, and bait fish all hide in the grass. That obviously makes it an attractive place for game fish to feed. Speckled trout in particular are associated with these deeper grass flats. 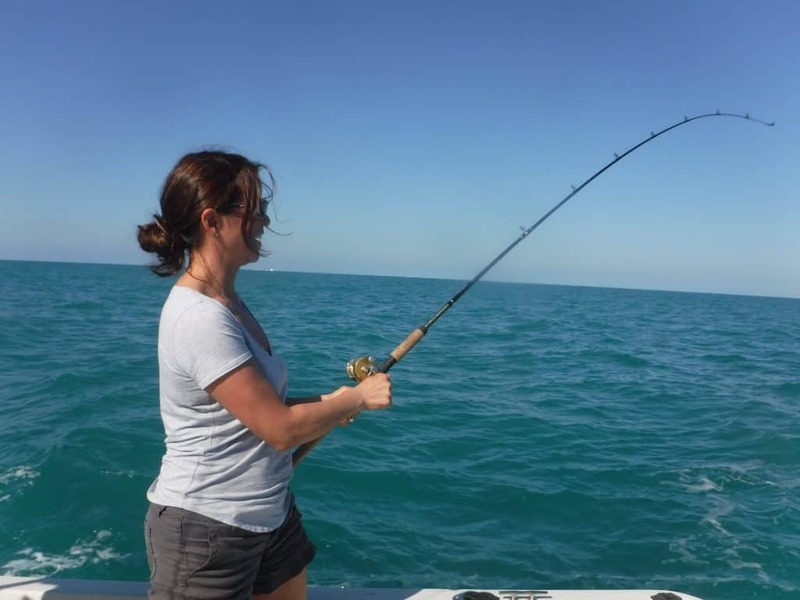 But anglers will also catch Spanish mackerel, Pompano, bluefish, jacks, a lot of ladyfish, snapper, grouper, cobia, sharks, catfish and more while fishing the deep grass at one time of year or another. We primarily drift fish while working the deep grass flats. Anglers cast out lures, flies, or live bait as we drift across a productive areas in search of fish. Bass Assassin jigs, Rapala plugs, and spoons are effective artificial lures. The top live bait is a shrimp. These are fished either free line or under a noisy cork. In the summer time, live bait fish such as scaled sardines are used. Both Big Sarasota Pass and New Pass produce a lot a fish for clients on Sarasota fishing charters. Anglers reading my Sarasota fishing report will see Big Pass in particular mentioned quite often. Sheepshead school up there thick and late winter and early spring. Mangrove snapper and snook are found in the rocks in the summer time. Ladyfish are often times thick right in the middle of the pass itself. Bluefish and mackerel can also be encountered as well. Anglers drifting the passes cast jigs out and bounced them along the bottom. This is very effective and produces Pompano, bluefish, mackerel, and loads of ladyfish. Free lining a live shrimp with a split shot or fishing a live shrimp on a jig head can also be very productive. However, when the fish are biting jigs are more efficient as there is no need to stop and rebate the hook. There is a ton of structure in Big Pass as well. This is particularly true of the whole area along the north side of Siesta Key. The water is deep, there is good current flow, and abundant structure. This is a recipe for an excellent fishing spot, and it is! Bottom fishing with live shrimp and bait fish is very productive. Anglers do need to time this during periods of lesser current flow. It is difficult to anchor in fish when the tide is screaming. Spinning tackle is used on the vast majority of my fishing charters. The reason is quite simple; it is effective and easy to use. Many freshwater anglers are experienced with close to faced reels. However, it usually only takes a few minutes before there casting like a pro with the spinning outfits. 10 pound spinning outfits are light enough that anglers enjoy the fight of even a smaller fish while still giving them a chance of the hook something larger. Anglers seeking a bit more of a challenge will opt to targets snook, redfish, and jacks in the back country areas. This type of fishing is more of a “quality over quantity approach”. I use the trolling motor to ease the boat along a likely looking shoreline, while anglers cast lures towards the shoreline. I do use live bait occasionally as well. 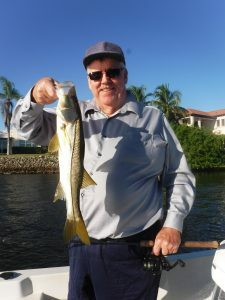 Visitors to my site will often see ”River snook fishing”in my Sarasota fishing report. This is a unique angling opportunity that I offer to clients. I am not aware of any other guide to do so. I use my 14 foot Alumacraft jon boat for this fishing. Shallow water and primitive ramps require this. However, this also results in less boat traffic and a quiet, serene angling adventure. The Manatee River, Myakka River, and Braden River, are all within a 45 minute drive from the Sarasota beaches. Each has a distinct feel and personality. The Myakka River has some stunning scenery and big snook. The Manatee River is pretty as well but a bit more developed. It offers the most variety. 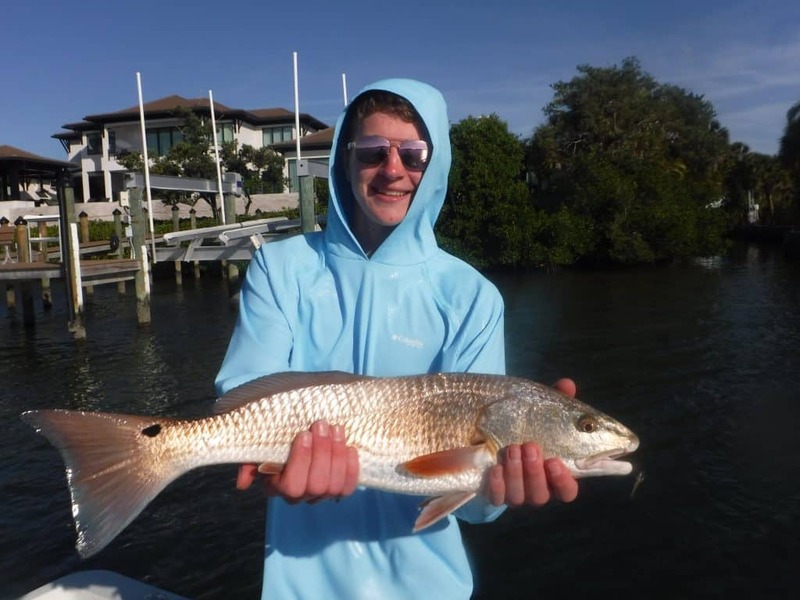 The Braden River is the most developed but offers fantastic fishing for jack crevelle in the cooler months. Snook and redfish are available as well. One unique aspect of fishing the rivers is the chance to catch freshwater species as well. The Manatee River and Myakka River are both brackish below the dams. This results in saltwater fish such as snuck, redfish, jacks, and juvenile tarpon being found in the same water as largemouth bass, sunshine bass, catfish, gar, and bream. These freshwater species will take the same lures meant for the saltwater fish. In the spring and again in the fall we experience runs of pelagic species. This means that they spend most of their time in the middle of the water column and do not relate as much to bottom structure. Spanish mackerel and false albacore are prime examples. 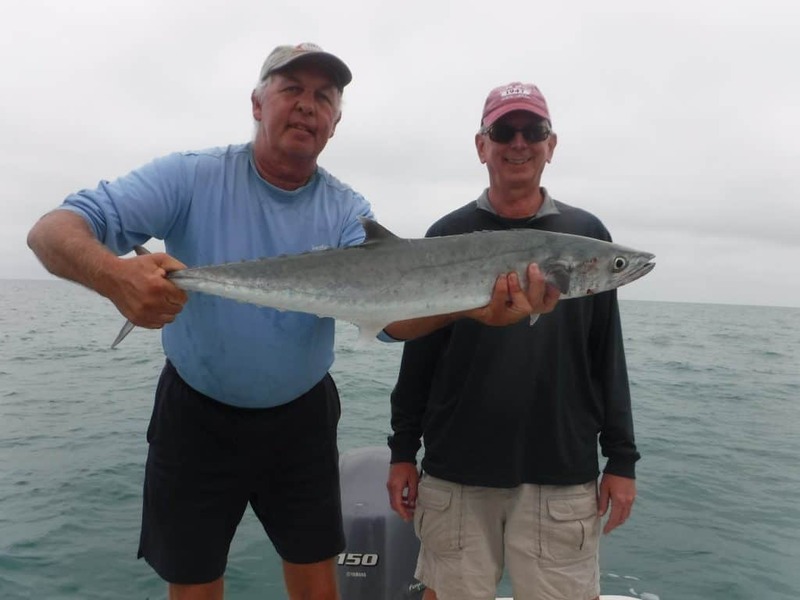 King mackerel show up here offer beaches as well. This fishing is dependent on conditions, the water needs to be clear and calm. When it is, fishing can be outstanding! This type of fishing is very exciting in that it is visual. Often times we don’t even fish until we actually see the mackerel and false albacore busting baits on the surface. We will also look for big schools of bait fish which can be seen dimpling on the surface. Artificial lures work very well when the fish are breaking. We will also catch some of the live bait fish and cast them back into the school of bait. On days when the fish cannot be seen working on the surface, trolling can be an effective technique. Trolling spoons and plugs is a great way to locate Spanish mackerel, false albacore, and even big King fish. It is also a great way to put a lot of fish in the boat quickly and is an easy technique for anglers with limited experience. The “inshore artificial reefs”will be mentioned regularly in my Sarasota fishing report. I am referring to three man-made groups of structure that were placed between one and to miles off of Lido Key. The Gulf floor is for the most part flat and featureless. Therefore, any structure will attract fish and hold them there. 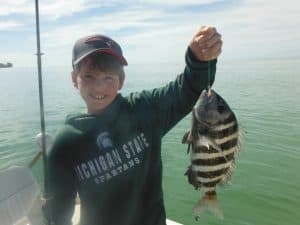 Those three reefs provide excellent fishing for bottom fish such as sheepshead, snapper, and grouper along with pelagic species such as mackerel, King fish, cobia, and false albacore. Fly fisherman are certainly not to be left out of the action! False albacore in Spanish mackerel will most certainly hit a well presented fly out in the Gulf of Mexico. This is terrific sport for anglers wielding a fly rod. Any inshore species that can be caught on a jig will also take a fly. Speckled trout, Spanish mackerel, bluefish, ladyfish, jacks, and more will hit a Clouser Minnow on the deep flats. Snook and jacks prefer whiteCrystal Minnow patterns in the back bays. An 8wt outfit is a good all-around choice for fly fishing in Sarasota. It might be a tad light if the false albacore are running large. Otherwise, it is a good choice for the water and species that Sarasota offers. An intermediate sink tip line and then 9 foot tapered leader with a 24 inch piece of 30 pound bite tippet finishes off the outfit. Readers will see a lot a families including children and my Sarasota fishing report. 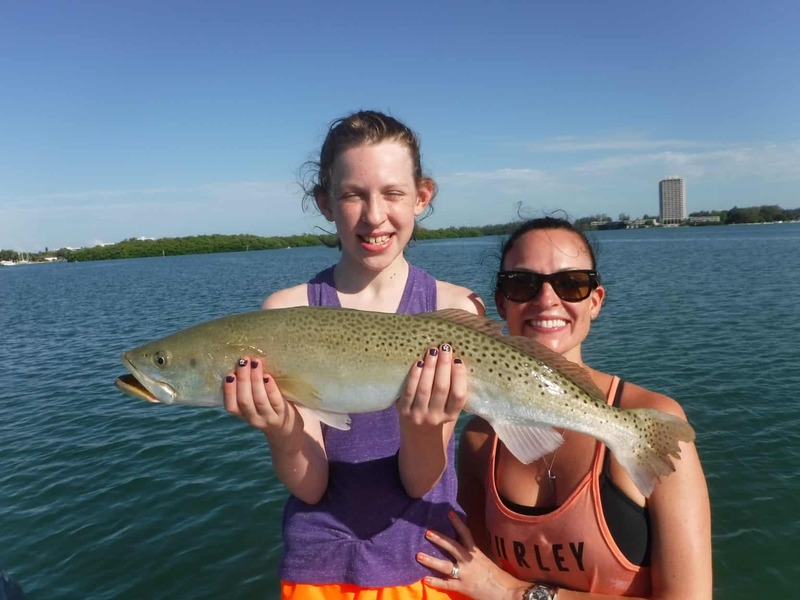 I really enjoy taking families out, it has become a big part of my Sarasota fishing charters. Many of these anglers have limited experience. One great thing about fishing here is that there are many species that do not require a great deal of skill or patience to catch. This is a good thing! Also, while I don’t mind if clients keep a couple fish for dinner, I strongly encourage catch and release. Sarasota gets a lot a visitors and thus a lot of fishing pressure. It is important that the focus of the fishing trip beyond catching fish and enjoying quality time with families. I will certainly filet and bag up your catch at the end of the trip. Current Florida fishing regulations and license requirements can be found HERE.